The Weekly Stuff Podcast #140 - Talking Final Fantasy XV News, Reviewing Daredevil Season 2, and much more! This week on the show, we start with a dive into a large grab bag of topics. Jonathan talks about his experiences playing Digimon Story: Cyber Sleuth – which Sean has been talking about for weeks (it’s great!) – and offers some thoughts on both Supergirl and Better Call Saul as they near the end of their respective seasons. Sean discusses the recent beta for the upcoming Doom game (it’s fun! ), and both Jonathan and Sean share their thoughts on the recent slate of Final Fantasy XV announcements, including our experiences with the newly released Platinum Demo. 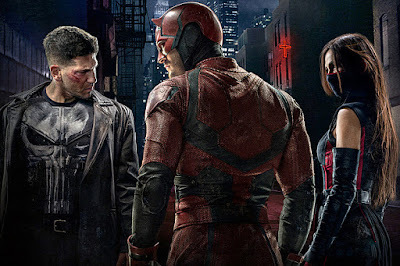 And then, for our main topic, we dive into a spoiler-filled review of Daredevil Season 2 on Netflix, which we’ve all hopefully has a chance to see by now. We were big fans of the first season, and in many ways, this season is an improvement, even as it retains some of the first year’s narrative problems. Either way, it’s a fun season to talk about, and a great reprieve from the general awfulness of Batman v Superman. Great episode guys! I believe Grant Gustin and Melissa Benoist were both in the Glee TV show so I suppose some chemistry could have come from that fact. Soon we might even have a musical episode of Supergirl. As for buying a new TV, I've found helpful websites where experts determine the best advanced settings for each individual model of TV using special software.